Whether you are heading to an exhibition or planning a big launch for a new product, you’ll want to make sure potential customers notice your brand. Our Birmingham branch are specialists in large format print and creating stunning graphics on a large scale, no matter how many are required. We also have some of the latest small format printing machines too, so we can take care of your entire event or business meeting, large or small. Marketing is all about making an impression that stays with the customer and what better way than positioning your brand on a large format that cannot be missed? We apply the same level of commitment to a single poster as we do to a large exhibition stand, because we know the important role each one plays in your business. 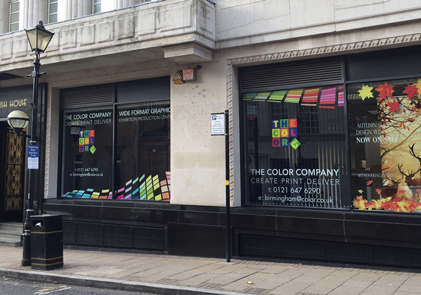 From window displays and vinyl graphics, to outdoor canvas banners and graphic drops, our Birmingham team are ready to put their expertise into action. We even provide an installation service in the Birmingham area, giving you every confidence your large format will be expertly positioned into place. The team also work closely with the Birmingham NEC and have established themselves as one of the key suppliers to the hundreds of companies exhibiting at the trade shows. We are just a 3 minute walk from Birmingham New Street Station, so convenient, it’s not just your installed graphics that are perfectly placed!